PIC32MZ devices incorporate a variety of innovative peripherals that allow it to interface with the external world. 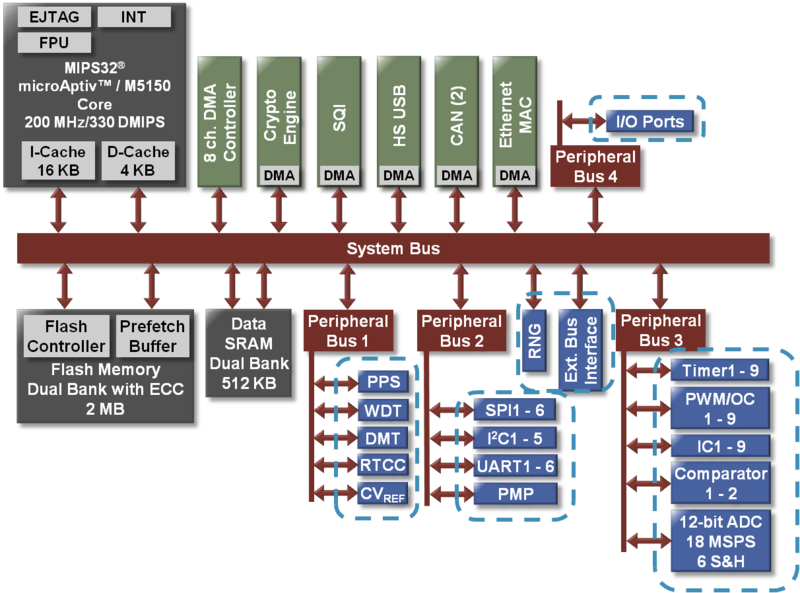 The peripherals are connected to the CPU core via several "peripheral" buses which enable you to optimize peripheral operating speed, while allowing the CPU to run at maximum speed (200MHz). Please visit this page to learn more about the PIC32MZ oscillator system and how to set-up the clocks for SYSCLK and the various peripheral buses (PBCLKx). Peripheral modules are fully documented in the family reference manual sections, listed on the device's web page. Refer to the specific device data sheet for the list of applicable peripheral modules.